TSE 427: Sell The Way They Buy! 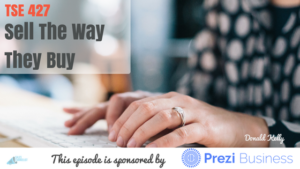 Home » TSE Podcast Post Page » TSE 427: Sell The Way They Buy! There’s something I want to propose to you, sell the way that your clients like to buy. It’s a simple but often overlooked principle by many businesses. Many companies focus on the sales, marketing, and figures which should be the case, but they they tend to have forgotten another major ingredient – Is this the way the customer is going to buy the product? Do they buy in a 3-step process? Or do they have a 6-step process? So here are a few things for you to understand, and really, hopefully, you take these by heart. The things you do online should be directly correlated to who you are in person. People you find online are still people. So you can’t just suddenly tell them to buy a product in three steps when they actually have a different process for that which could consist of 5 steps or 6 steps. Find out who makes the purchases. Most large companies have a procurement department that is in charge of the final purchase. Sure, you may have sold it to a decision-maker and they’ve already signed off. But you still have to understand that they might have some procurement process that you need to go through. Additionally, government organizations have a very different and quite longer procurement process so you have to be aware of that. So make friends with the procurement department and find out what their process is. When working with small organizations, they may be making purchases more in recurring revenues rather than a large lump sum. Sit down and write out a process of how your customers buy. Reach out to their departments and find out what they need to do, what documents are needed, etc. Don’t get stuck in contract hell. Learn all the details. Think like the client. And have their best interest in mind. Don’t give boring presentations. Don’t give boring presentations. Don’t give boring presentations. Nope, this isn’t an error. We just can’t stress enough how PowerPoint presentations can be so boring and it’s time to put an end to that and welcome a new way of presenting that heightens customer experience and engagement. Get a full demonstration of Prezi Business and see the power it has in action. Just go to www.prezi.com/TSE to help you tell more compelling, value-driven stories to your prospects.